Body: Wolf head, cheetah body, dragon wings. Colors: Fluffy coat. Black main fur, white belly fur, white fur on back of legs. White marking on forehead, looking like a star. White marking on tailtip. Grey wings. Red, spiked collar. My character's name is Zita. I created her in 2007 during some free time in school. Her name is also my artistic name and a nickname I am known with on the internet. My character's main form is feral (walking on four legs), but she is anthropomorphic, means she can talk, use her paws like hands, etc. However it is possible to show her as Anthro (bipedal) too. As Anthro, I also sometimes put some red and black hair on her head, just like mine. Zita represents me, it is not just a random roleplaying character. Zita is like a mirror of me. 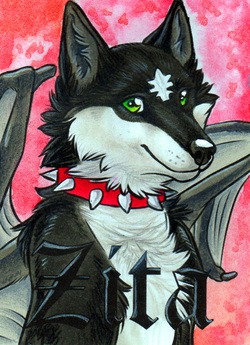 I had a lot of characters to represent me in the past, but Zita is the one I've been sticking with the longest. for me. Still having the dragon mind, I decided to put some of this creature into my fursona, too. This is basically the story how my fursona came to be. The black/white/red color combination is also a thing that had always been important to me. 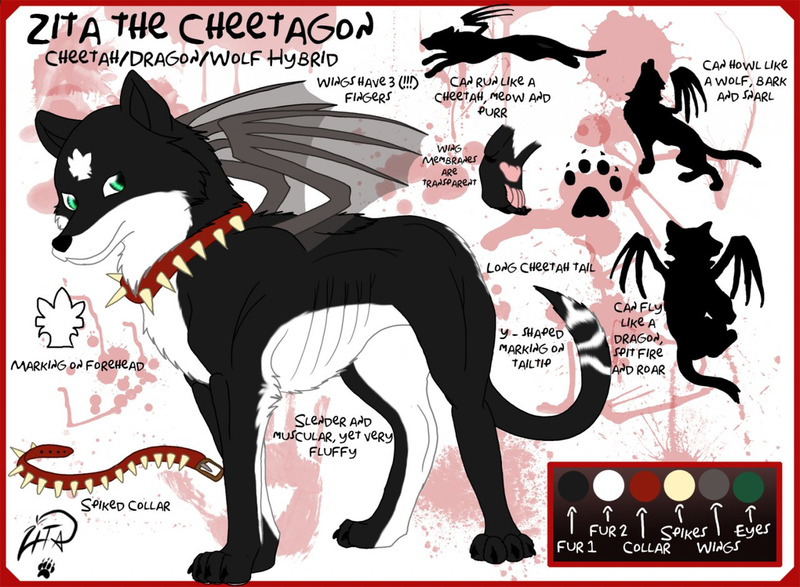 Current character sheet: Zita in her main form (feral Cheetagon). Bipedal anthro version is possible, depending on the situation. In 2015, I decided to pull a prank on my friends because it was the 1st of April. I made a King Cheetah character from scratch and told them that this is my new fursona now and that I decided to ditch the Cheetagon. Everyone seemed to aprove of my choice. As the end of the day was dawning and I started to reveal that it was just a prank, my friends just kept a straight face and said "No. We like this one better." I was confused, but they just stated: "This fursona looks better. We'll just draw this one from now on." I didn't have much of a saying in it, but after recieving some Gift Art from my friends, I actually grew quite fond of the Cheetah and decided to make her my alternative fursona. 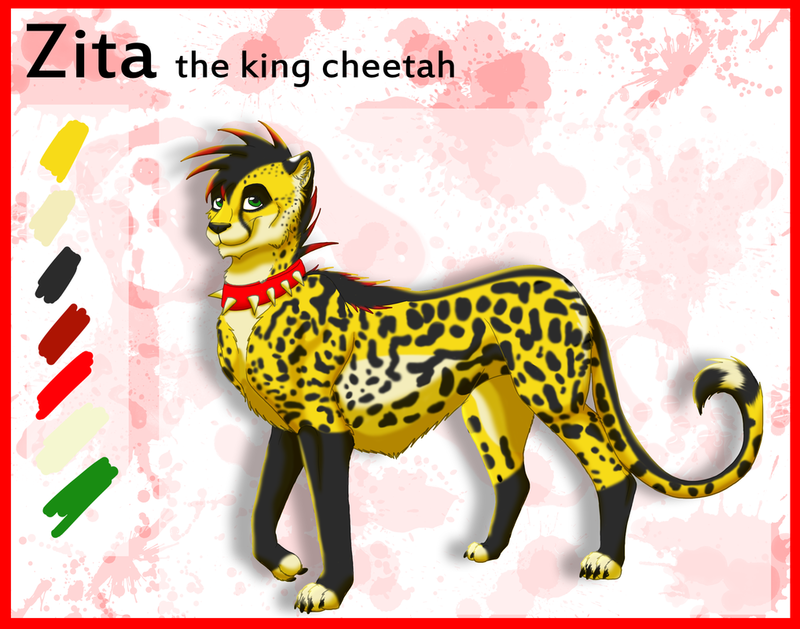 The only outer appearence that Cheetagon Zita and Cheetah Zita share is the red spiked collar.